I love the bright colors in this collection. They always gives me that happy feeling because every color is different. You can use your own stash and select the 24 colors that you need. But you can also use a color card with the 24 rainbow colors from Windham Fabrics and Anthology Fabrics. Jacqueline designed this quilt early this year. It was a nice project. It was her wish to design a quilt with lots of flying geese. And while she was sewing on it, the whole project came together and it was flowing naturally. The gorgeous center star is one of her favorites and with that she started. The first flying geese circle was quickly made and the pretty small stars were a perfect size to fit precisely between the two flying geese circles. White batik for the inner circle and black for the outside and the borders. The beautiful corner parts as finishing touches complimented by her black-and-white signature fabrics completes this fabulous design. 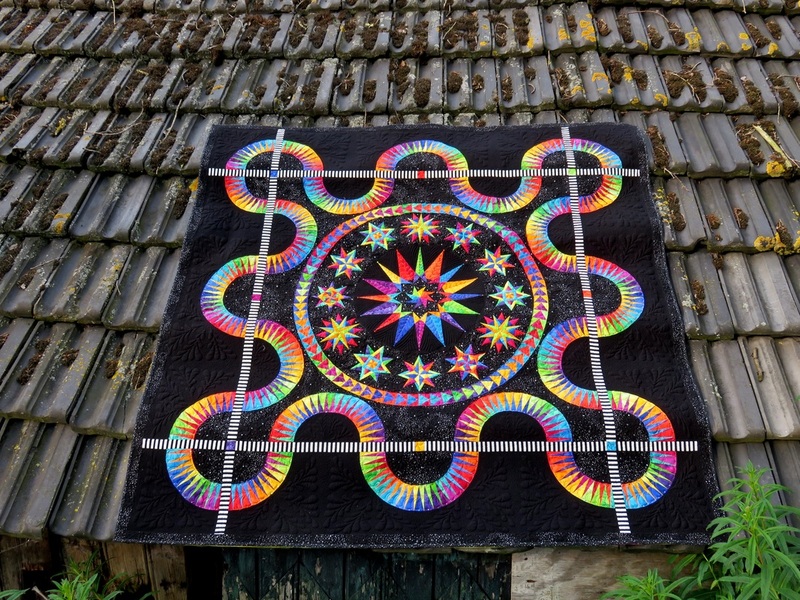 ​Cindy Glancy has worked her magic with the stunning quilting. ​Here is WOW, a.k.a. Black Magic. A stunning design in the fabulous Rainbow Colors. Breathtaking beautiful with eight magical stars around the spectacular designed center piece. The center star is just phenomenal. A brand new designed star folded like origami. The spectacular little stars were quickly designed and as you can see, amazingly beautiful. Up to the next part, the marvelous center piece. Let's call this fabulous star.. Yes, how do we name this eye-catcher of a star? Jacqueline finished the whole center piece. Adding the beautiful spike borders, the black-and-white striped fabric as a finishing touch and a new design is ready. It is one of our favorite designs of this years collection. 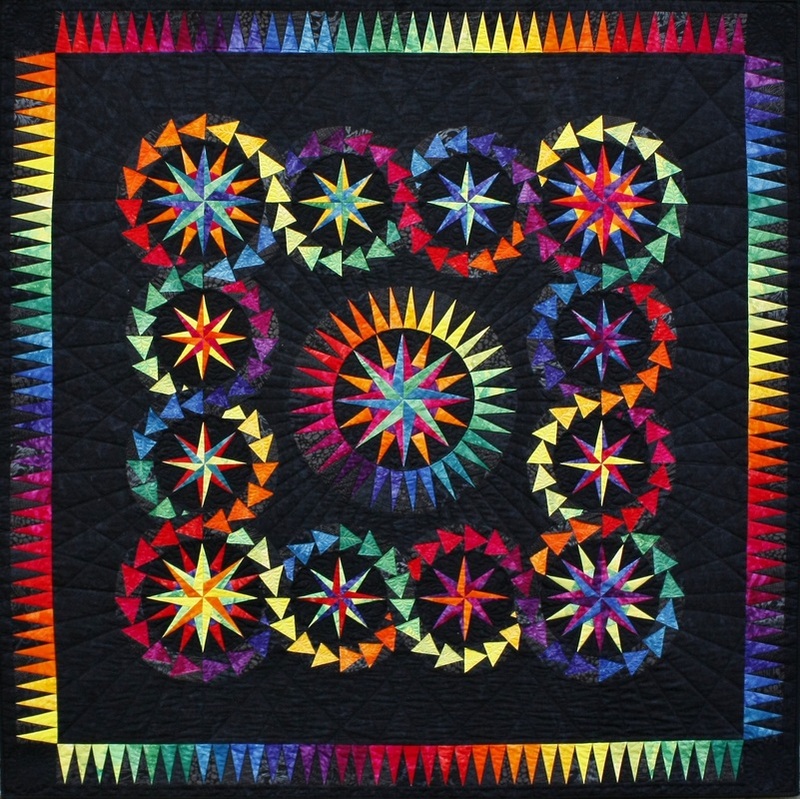 ​A fabulous quilt of Jacqueline in the bright and colorful Rainbow colors. Inspired by Art Deco, this design is a stunning wall hanging and could easily enlarged to a bed quilt. It took Jacqueline a while to have the perfect colors for this quilt. There was the design and JJ wants to make this in another color scheme. However, it doesn't work. It was just not that what makes this design special and attractive. Finally JJ decided to choose for the Rainbow colors. And not a bad choice at all! It's a beautiful 5* pattern. A challenge, but so worth the effort! The quilt work is stunningly done by Cindy Glancy, and Carolyn Bradley did the binding for Jacqueline. 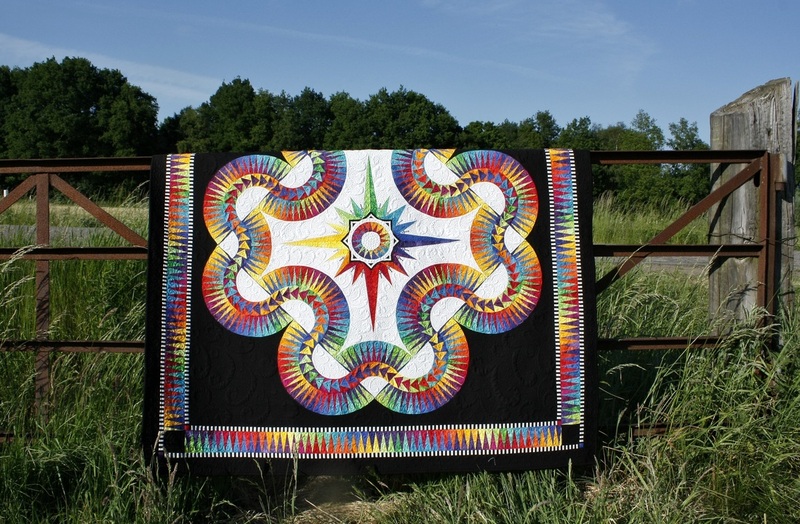 ​In 2013 Jacqueline won the first place pieced in the Hoffman Challenge with the stunning design "Celtic Fantasy"
Since then, Jacqueline received lot of requests for that quilt. And this year your wildest dream come true: "Infinity", a 6* design for the intermediate quilter. My dear friend Cheryl Harris took care of the binding of this beautiful design. 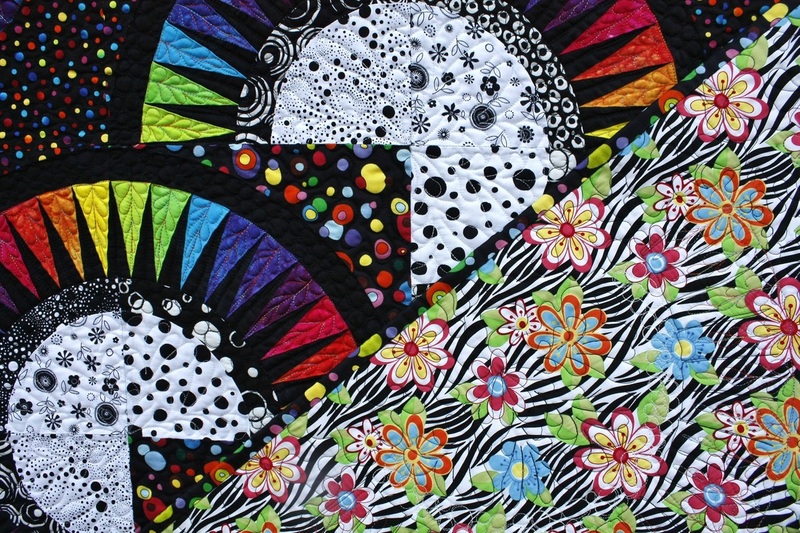 The gorgeous quilt work is done by Tammy Murphy - colourmequilted.ca, from Uxbridge, Canada. ​A little update on pattern part C will follow soon. 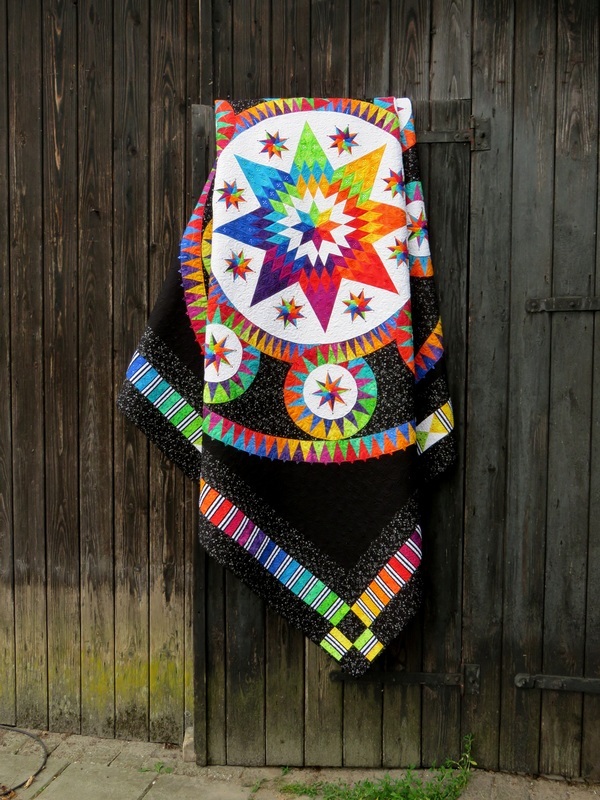 ​This gorgeous wall hanging is the only "Rainbow Quilt" for this season. But it's a lovely one. The stars, spikes, the flying geese border and the sashings in Jacqueline signature striped fabric, making this design into a wonderful and fabulous quilt. 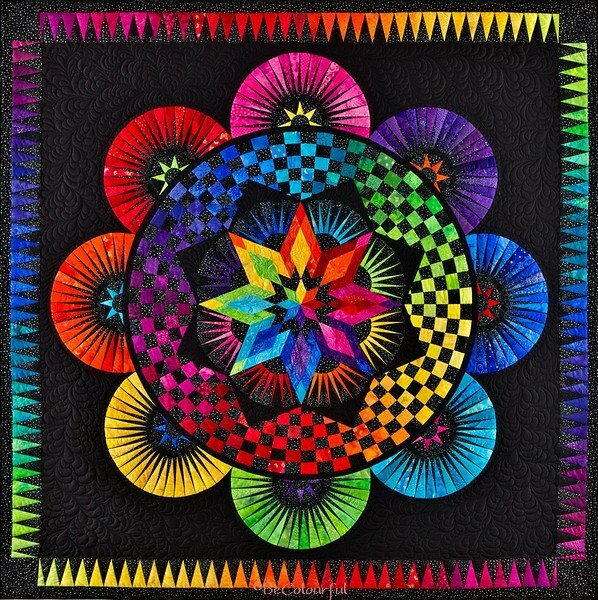 The stunning quilting is done by Tammy Murphy - colormequilted.ca. Just look at those feathers..
​Circle of Life is the pattern that made us famous all over the world! 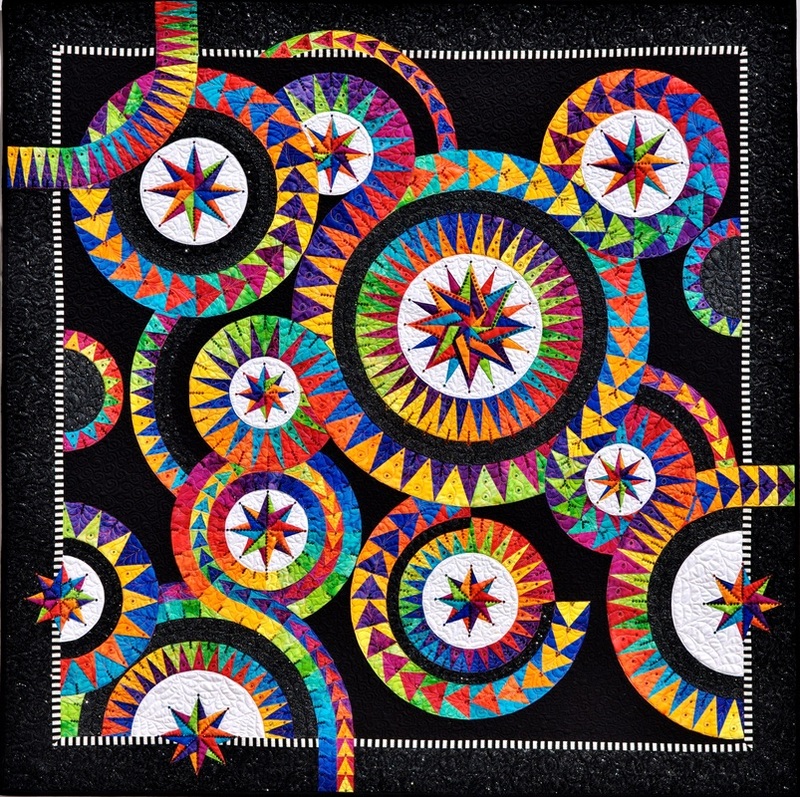 This pattern has been made by so many quilters in the world and entered into local, State and Nation wide shows and contests and a lot of those quilts actually won prizes! The traditional lone star made in bright, sparkling and up-to-date colors that flow fluent into each other, the pyramid pieced checkerboard border in the vibrant colors keeps catching your eye and is a jewel on your wall! 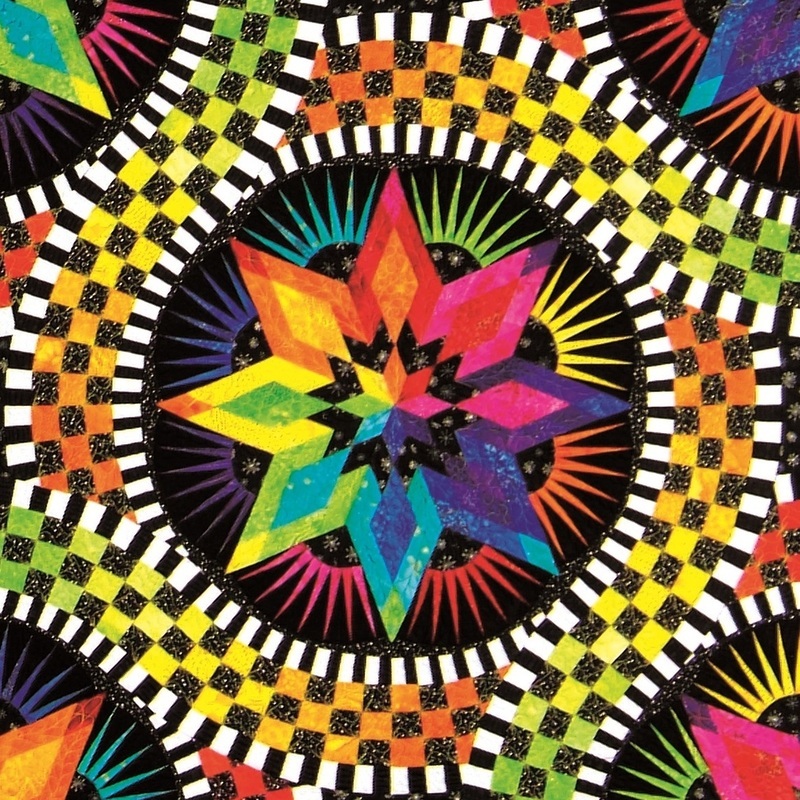 ​"Enchanting Stars", formerly the Colorful Quilt. Enchanting Stars is a real eye catcher on your wall. The bright colors compliment the black fabrics And as you probably know I love my black and white stripe in my designs and we think that small black and white stripe add something to this design to make it even more spectacular. While I was making this stunning quilt, I've made a lot of "making of" pictures. We do not show you how to paper piece, but we show you all different techniques how to assemble this beauty yourself. Stars of Light is the substitute for "Stars in the Night"
Years ago I have made "Stars in the Night". But we all know, in the beginning of BeColourful you have to trace the pattern parts and because "Stars of Night" was always such a popular pattern, I decided to turn this old pattern into a brand new design. I have not only used black as main background but I also use a black fabric with a tiny silver star and of course my black and white strip. But the most important change is the white background fabric in the center part and around the stars. That is why "Stars in the Night" turned into "Stars of Light". I also have used the beautiful and bright Anthology fabric line. These colorful and stunning fabrics were wonderful to work with and the colors blend so very nice in to each other. I’m very happy and proud with the final result. 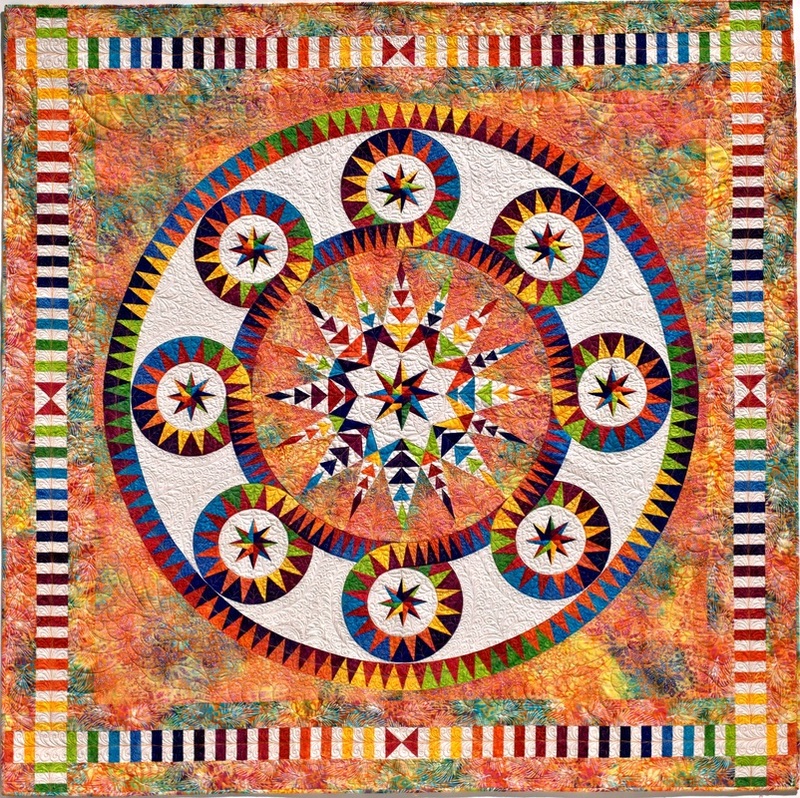 We also offer a stunning kit with the exact same fabrics as my original "Stars of Light"
If you take a close look to "Stars of Light" and "Wheel of Fortune" you recognize the star circles and the piano border parts. And indeed it is almost the same pattern and the same size. I have made two different versions of this beautiful pattern. That is also the reason why you find one quilt and two different centers in the pattern. 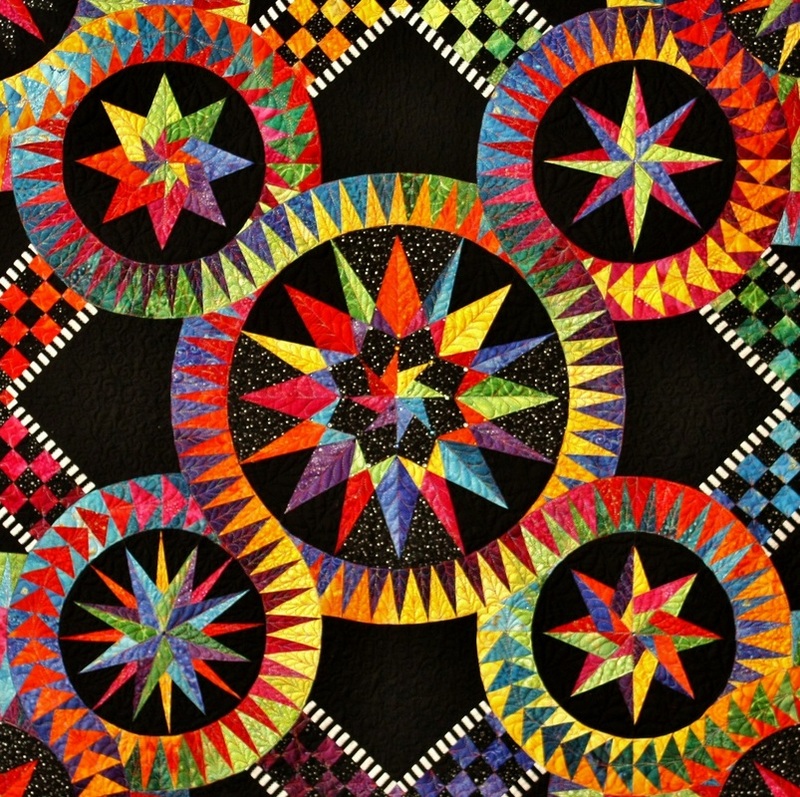 You have two opportunities in the pattern and you can decide which quilt you want to make: "Wheel of Fortune" or "Stars of Light". That’s why you find two covers, two backsides, two fabric descriptions and two booklets in the pattern. ​Ever changing swirls and curls fitted in a baby block. Back in the days when I've visited Paducah in Kentucky I was also invited by Hancock’s of Paducah to do a trunk show. While I was there Moda just introduced their new Kota Batik fabric line. The only challenge for me was, I had to use all the colors of the fabric line in my design that were available at that time. The result of this challenge has become Curling Colours. I've used all the 60 colors I received, even the somewhat dull browns, greys and beige ones… You probably can imagine that these colors are not here favorites. The curves are gentle and the New York Beauty arches are flowing into each other. The result is a quilt with a lot of motion that keeps attracting your eyes. Catch me... If you can! Catch me.. If you can! Is about the ultimate in paper piecing! 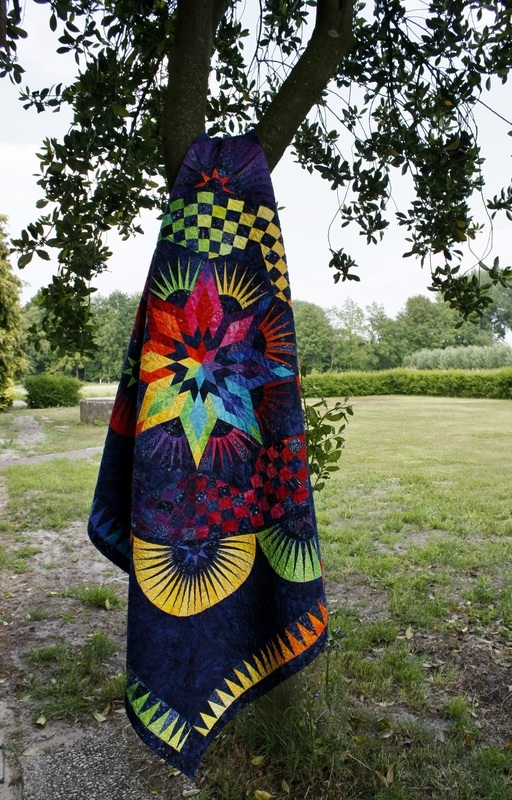 For the base of this design you have to look at the quilt “Elements of Nature”. This quilt was originally designed for our entry in the 2009 Hoffman Challenge where I've won an Honorable mention for that quilt. The result is Catch me.. If you can! When you take a close look, you will see that Elements of Nature is only a quarter of this quilt. I've put in every effort to make this quilt as over the top as possible. I've used more than 150 different fabrics and colors to make it as stunning as it could be. 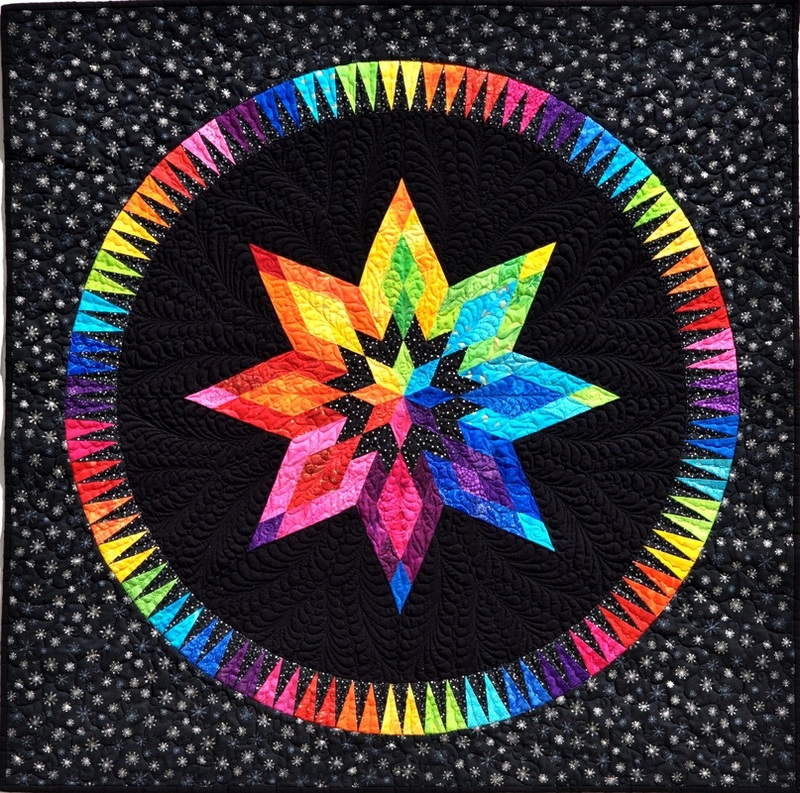 Also the quilting and the limited amount of Hot Fix Swarovski ® Crystals makes this quilt a feast for the eyes. 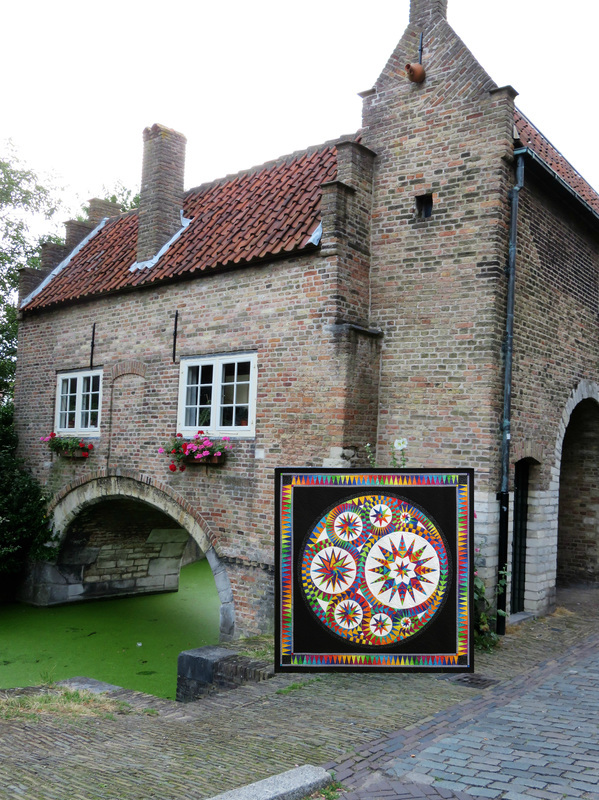 In the Netherlands I won the Trophy for color and the Viewers choice at the Open European Quilt Championship. At the Road to California show I was third. Surprisingly Red is one of the patterns that is on the market since the start of BeColourful. We have made this quilt in first instance in light blue pastels, rose fabrics and warm reds and they are brought together in perfect harmony in this stunning quilt pattern. But the fabrics that we chose for the original quilt are not available anymore and the search for alternative fabrics is for a lot of quilters almost a mission impossible. When you like paper piecing and New York beauty arches you can enter this quilt with heart and soul. 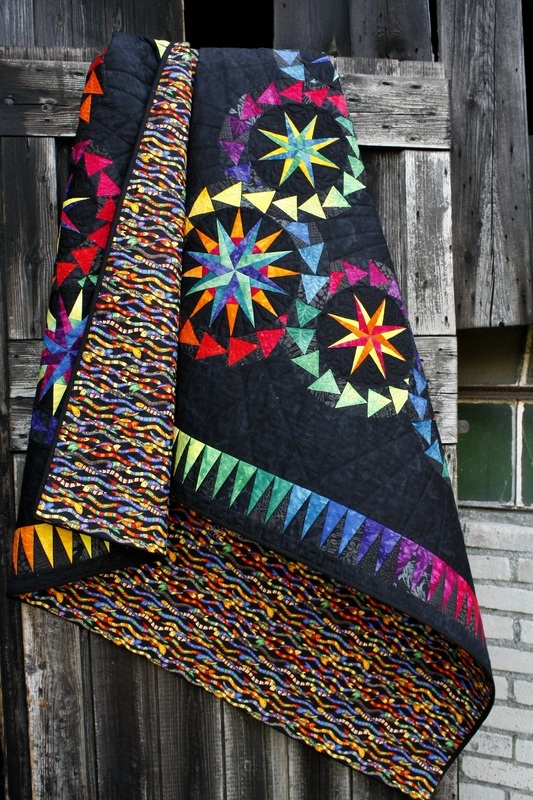 The fun with this quilt is that it will hold your attention. First you see the complete quilt with the arches, then you see the swirl and later you see the square around the large mariners compass. This has been a very popular pattern from the beginning and we have decided to re-draw and re-write the pattern entirely. I've also made a complete new quilt and now it is called Aurora. It is made with the 24 color groups and black and white as background. The sparkling effect is accentuated by the use of the Hot fix Swarovski ® crystals. 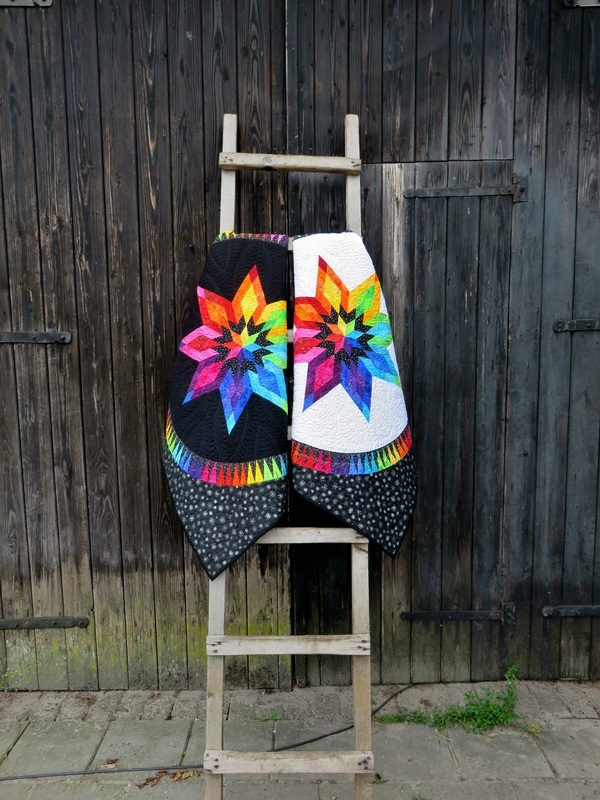 We have a complete new pattern available to make this quilt yourself! And as you have knowledge of the paper foundation method, this is your chance! ​Brilliant Beauties of Joy is the evolution of the original pattern “Joy”. The pattern that made the start of Be Colourful as Pattern Company. In 2003, when I had a burn out, I was working on a special design with lots of colors and the famous multi sunflower fabric from Hoffman California. When the quilt was finished our father insisted on entering the Open European Quilt Championship, as he was sure that this quilt was so special and unique. 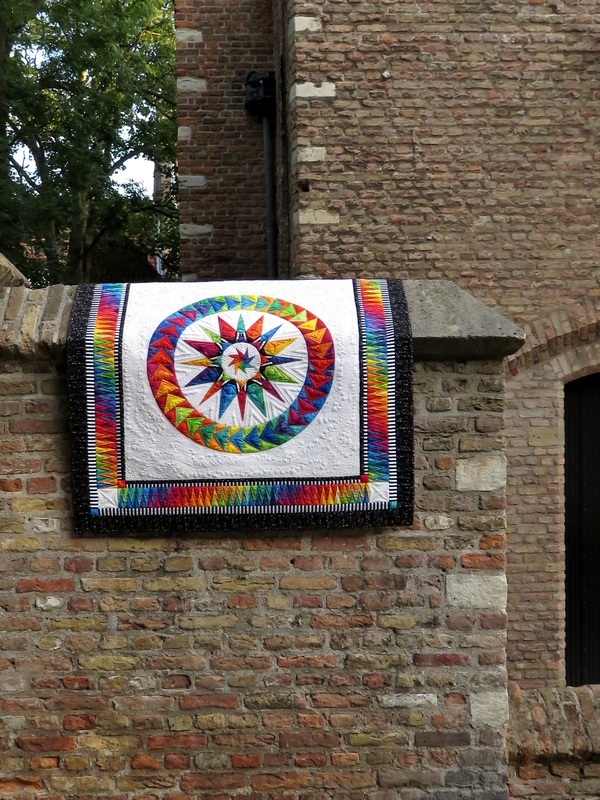 Finally, I agreed and sent the quilt to the OEQC organization. Guess what? I won the Color Trophy that year. And when the quilt was displayed there, people started to ask: “Is there a pattern available? ?” And this is where it all started! While the original (and very popular) pattern, where you have to trace all the pattern parts, is still available, Jacqueline had the idea to release the pattern again, but in a “full service” issue: The quilts has become slightly larger, all the pre-printed foundation papers comes with the pattern, the “Paint by number” technique for all the foundation points and the rainbow border and detailed fabric and cutting instructions. So she made new drawings and made the quilt again, now with a black background, as the original sunflower fabric is so hard to find. Are you in for something different? This is…. I think, a real beauty to make. The challenging curves looks so difficult… don’t you think…..? Well, I can tell you that with the easy to follow instructions and schedules these curves are so easy to do. 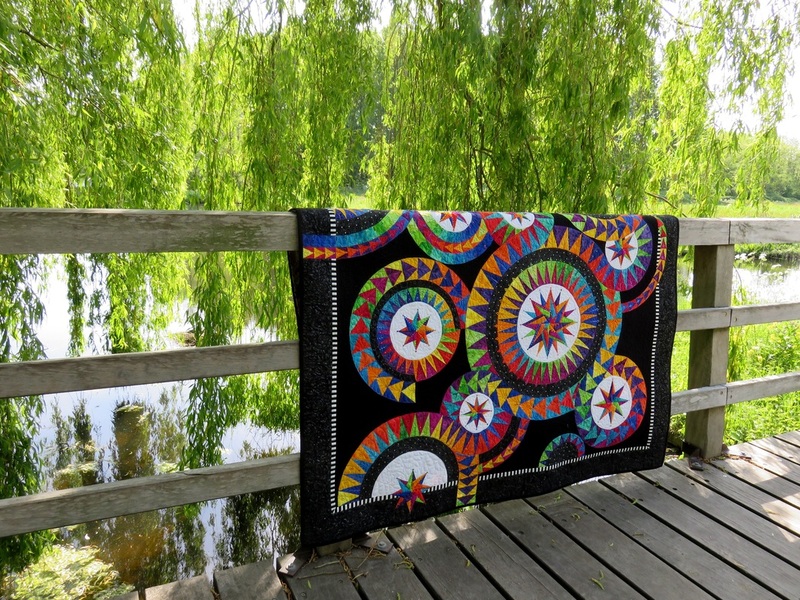 And the final result will be a stunning quilt hanging on a beautiful spot in your house. 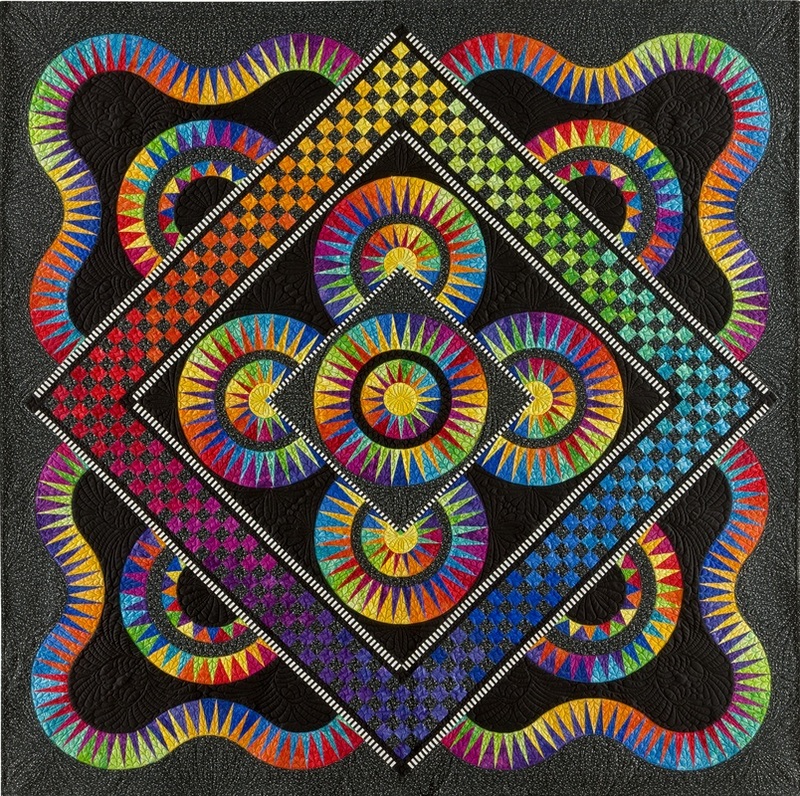 I choose 16 of my 24 favorite batiks and add 8 different black fabrics to it. 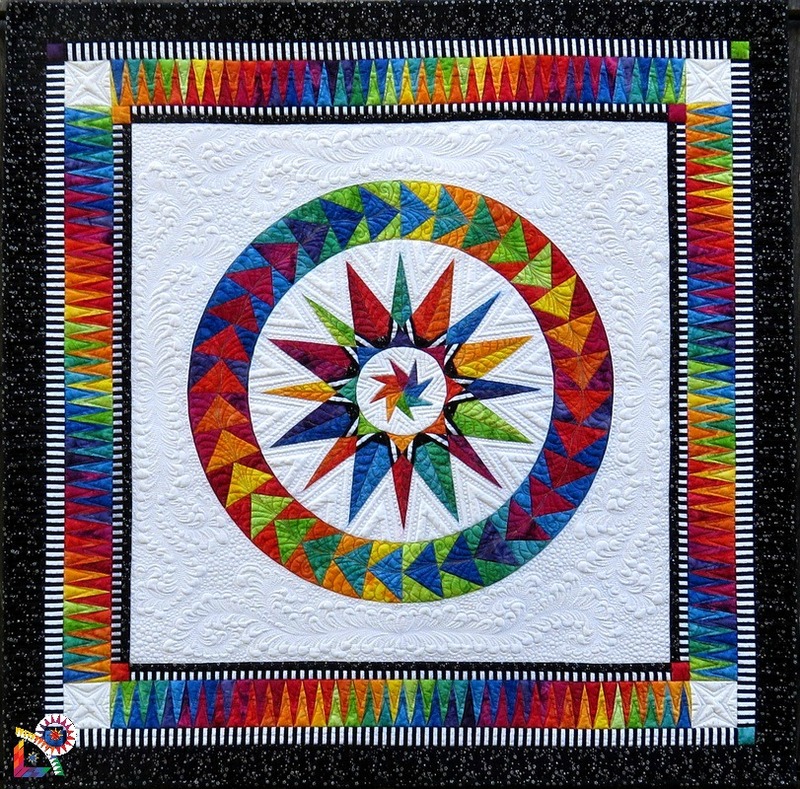 You start on the outside with the flying geese borders and go in to the quilt to make the spiked circle around the beautiful center star. After that you make all the other stars which are sparkling in the flying geese circles. We finish this gorgeous design with a spiked border. Are you in for something different ……. 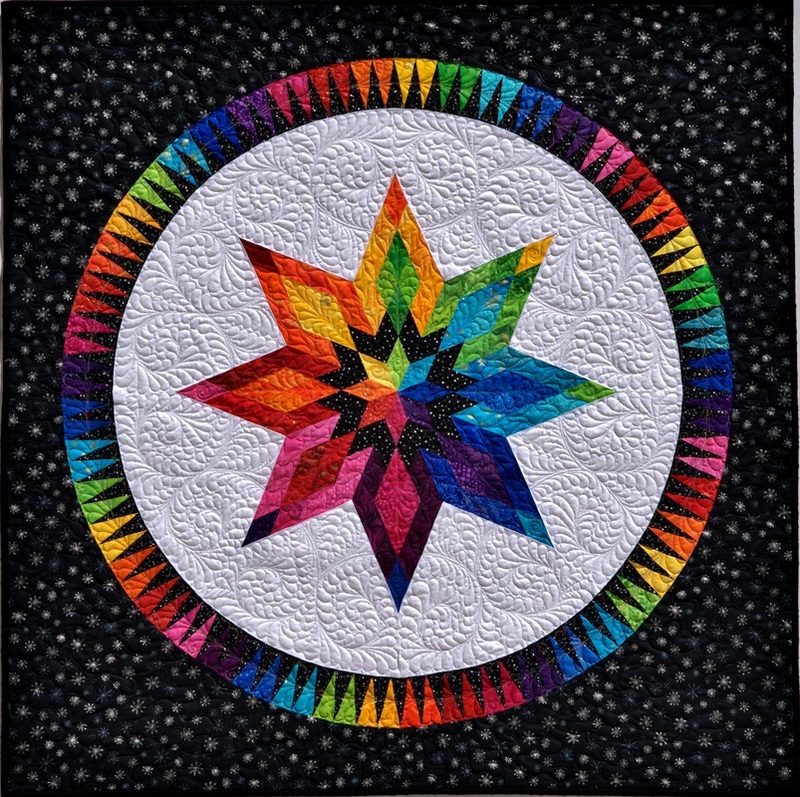 Rainbow Stars is one of those patterns that attracts the eye. The inspiration for this design came from the beautiful Cosmati mosaic tiles and stained glass windows in the churches in Spain and Portugal. In the thirteenth and fourteenth century the Cosmati craftsman where true masters in this kind of mosaic floors and even now, in this century I’m still inspired by this beautiful art. There is a pattern available to make this quilt yourself. The pattern package contains the templates of each pattern part on true to life scale, but you have to do the tracing yourself. This will make the journey to make this quilt even more challenging! ​Ever once in a while each quilt designer wants to compete with other quilters in the world to see if his or her work is still appreciated. And I'm no exception to that. Listen with your Eyes is a combination of paper piecing and cutting. You have to make the five lone stars in the centers of the chequered board borders from strips and you cut the star points in a 45° angle using a ruler. 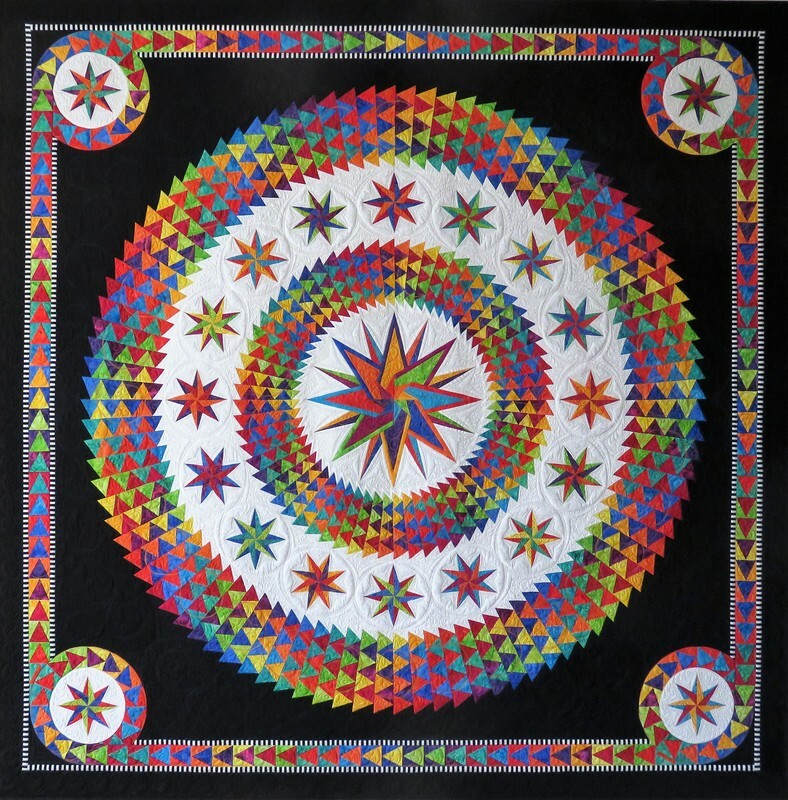 The remaining of this quilt, the New York Beauty arches in the corners of the Lone Star star points and the chequered board borders are made with the paper piecing technique. More than hundred of different fabrics and colors were used to make this quilt as stunning as can be. 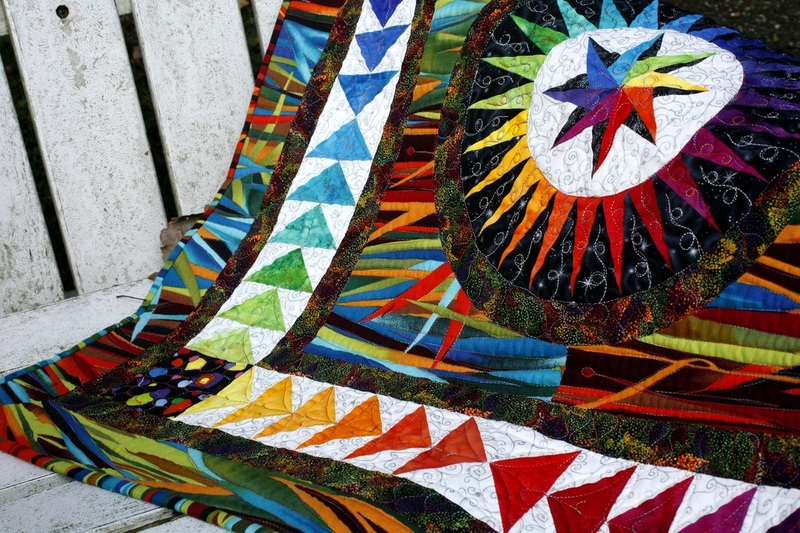 Also the special quilting in rainbow colors added a lot to the overall appearance. 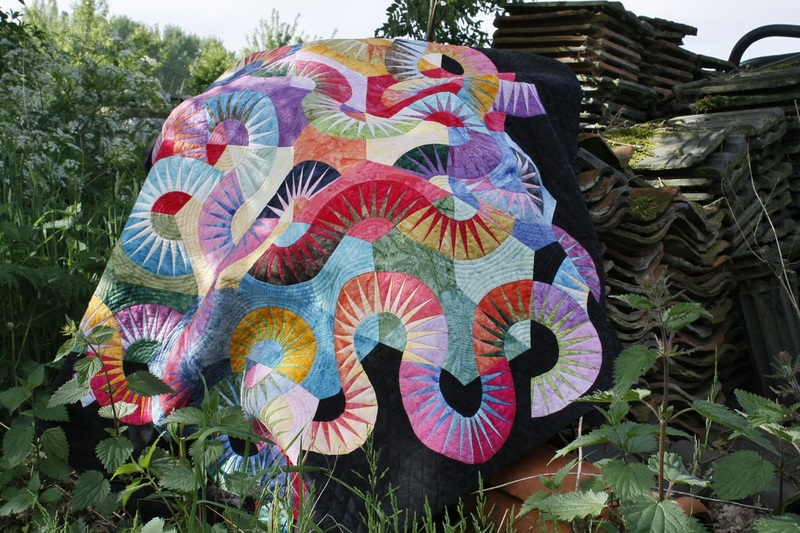 Are you in to make a stunning quilt? Like we always say: a picture never justifies the real thing, it is truly applicable on this quilt. You can clearly see how the colors flow into each other and you absolutely see the lighter and darker spots on the quilt. What you don’t see on the picture are the numerous Hot Fix Swarovski ® crystals all over the quilt in the colors of the fabric. 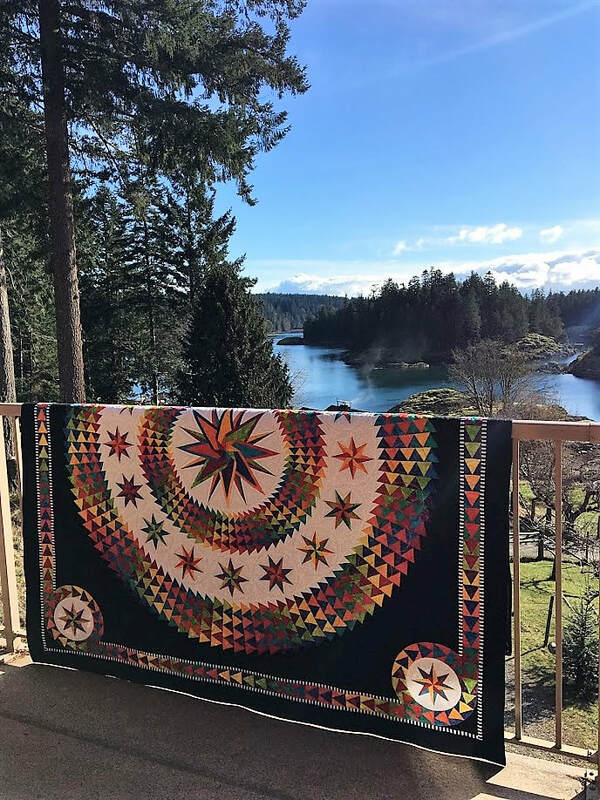 Hang this quilt on your wall, with proper lighting, and every time the quilt will move by a gust of wind or you walking by and you see the sparkling colors all over the quilt, it can only make you happy and proud on yourself as you were the one who made this stunning piece of art! There is a pattern available to make this quilt yourself! And as you have knowledge of the paper foundation method; this is your chance to make this beauty yourself! ​I was inspired by a picture of the Kremlin in Moscow. 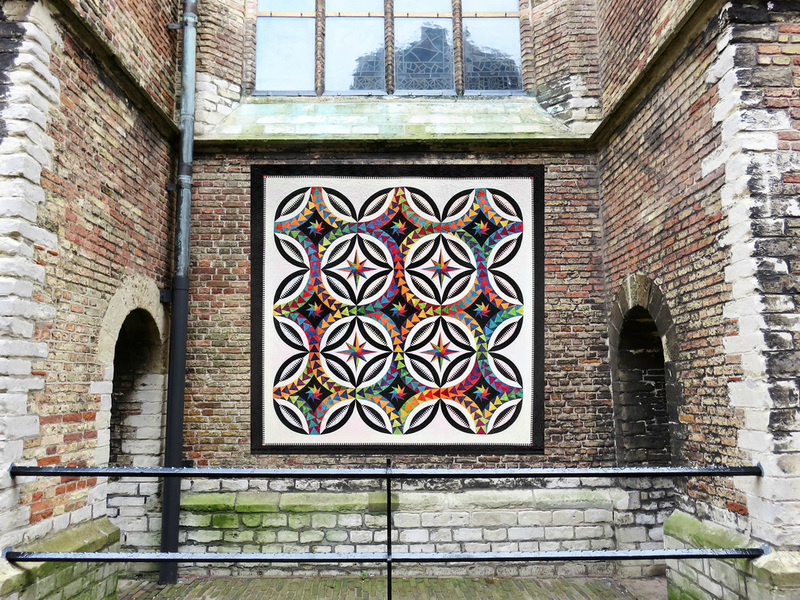 The beautiful shapes of this building intrigued me so much that the drawing that I've made became a quilt, named Jewel. Jewel is made from all kinds of scraps from quilts that I had made in the last few years. I've separated them in 2 color groups to use in the ovals. 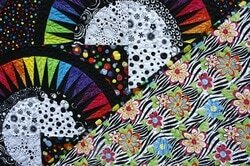 The effect was so incredible sparkling and bright that I could not put the ovals a side… I needed to finish the quilt and with the black base it became just the quilt that I wanted it to be. For the finishing touch I initially added spangles and crystal beads to accentuate each star. Later these beads have been replaced by Hot Fix Swarovski ® crystals. 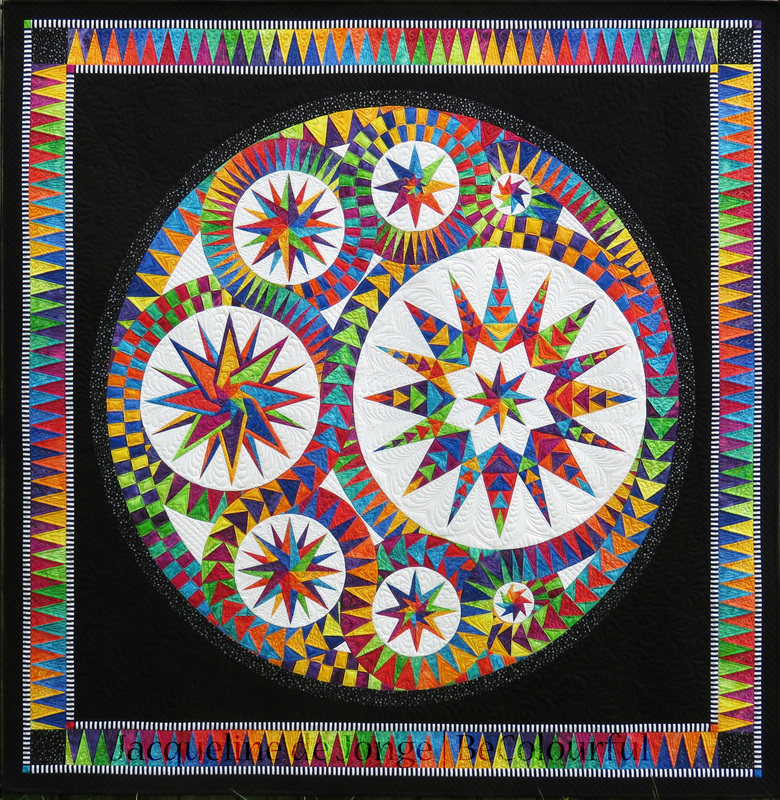 There are quilters that have entered contests with this quilt and one deserves special attention. A lovely lady made this quilt with scraps made from the ties from her deceased husband…Beautiful… she won the first place! 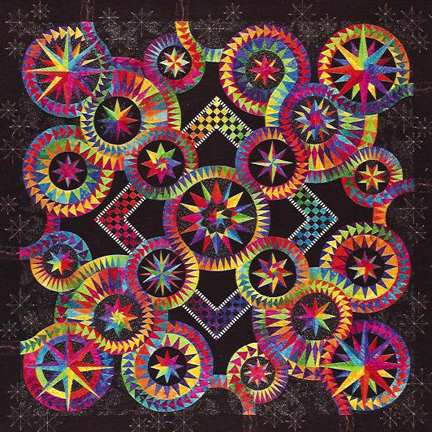 There are two different Jewel patterns available to make this quilt yourself: Jewel and Christmas Jewel. The pattern package contains the templates of each pattern part on true to life scale, but you have to do the tracing yourself. This will make the journey to make this quilt even more challenging! Summer Dream was our Facebook project during the summer of 2013. We decided to design a quilt and post "how to make...” pictures on Facebook. The "making of.." of this beautiful quilt is here at our website, in 9 episodes I'll show you how to make this beauty. 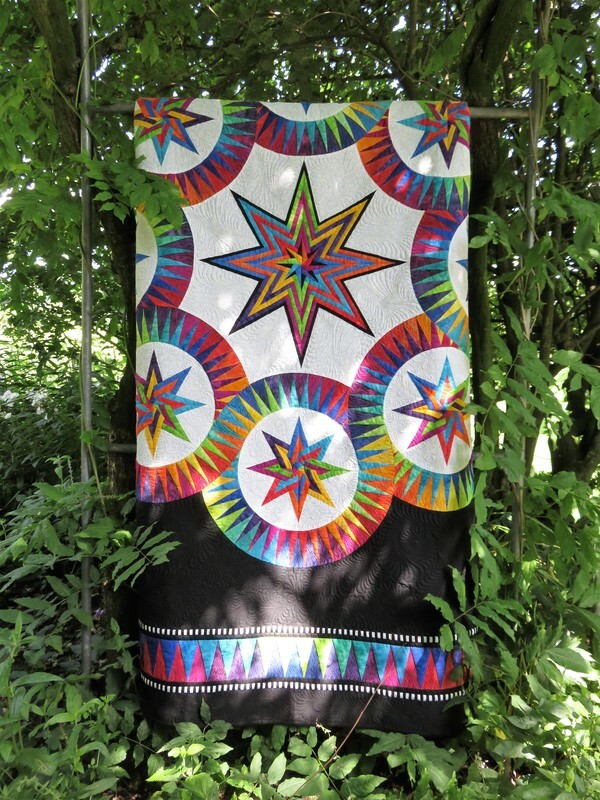 I used all the 24 bright batiks from Hoffman that I had used before in another stunning project like "Brilliant Beauties of Joy". You only need 6” x 44” of each of the 24 colors to make these beautiful stars and diamond borders. All the fabrics are combined with the multi-colored Sunflower fabric of Hoffman and of course her favorite black and white striped fabric. So now we have a pattern available to make this quilt yourself! And as you have knowledge of the paper piecing method; you can do it! 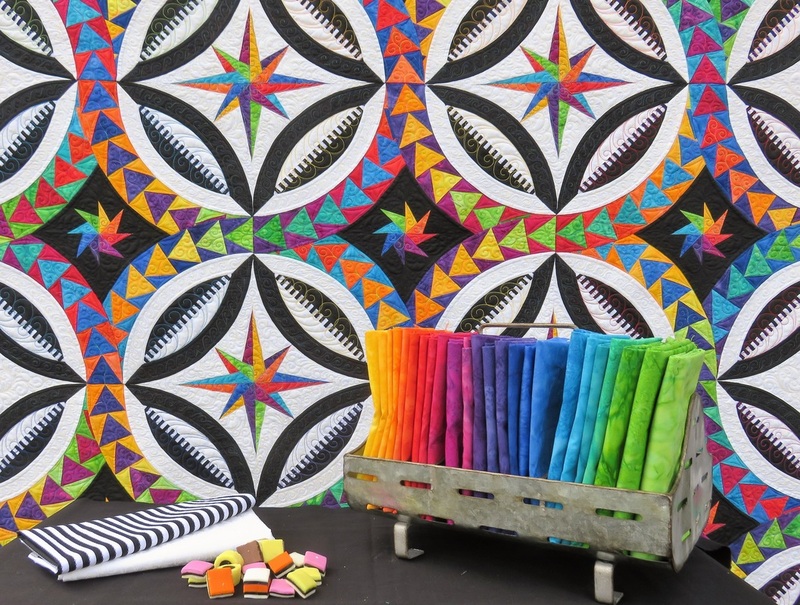 The Happiness quilt is the perfect starter quilt if you're new to paper piecing. This quilt featuters all the techniques you'll find in all my designs. The spikes, the circles, flying geese, sashings, corner parts and the mitered corners. You will work your way through this nice small wall hanging step by step and the result is a wonderful happy quilt. This quilt project that is also great for the intermediate and up skill level and is a great way to try out my techniques on a smaller scale. "Happiness" is also a great design to use your own fabric choices. You'll see the result in 4 different color ways. 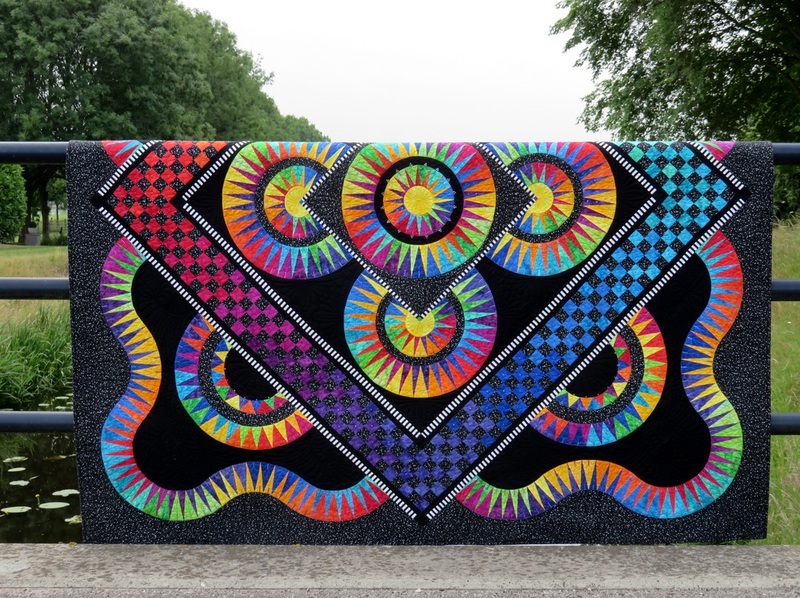 For 2019 we'll design a new beginners quilt, which will feature all the BeColourful techniques. ​We know you love "Circle of Life", but we also know that "Circle of Life" could be a challenge.. maybe just one step too far for you at this moment. I designed this small wall hanging for you, just to try something different. If you follow the step by step and the paint by number instructions you will see how fast and beautiful your "Bright Star" will be. I'll show you this beautiful small wall hanging in two different background colors. 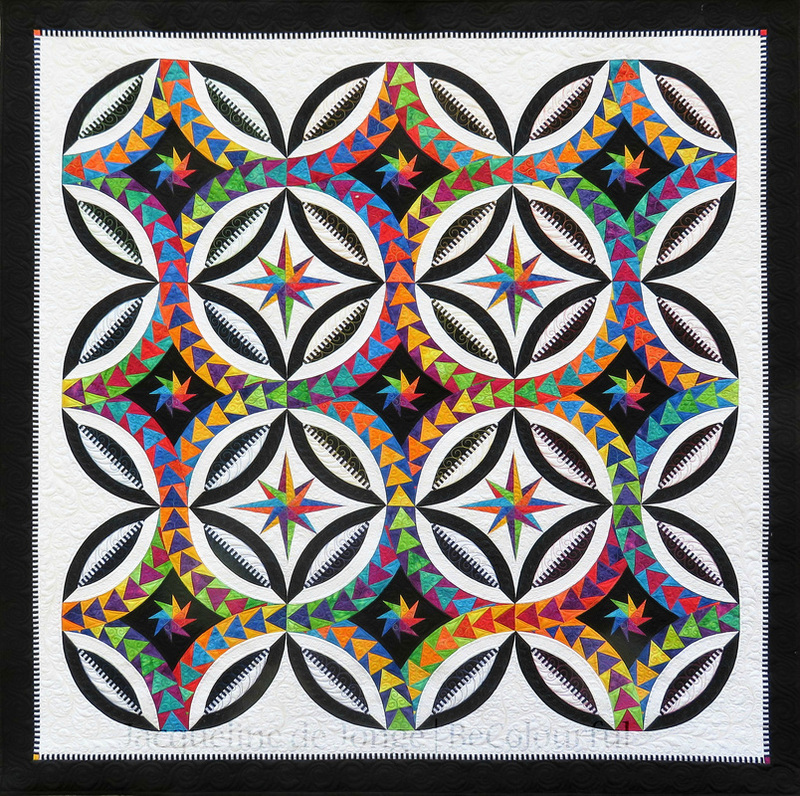 The black version is my favorite but I love the stunning white "Bright Star" as well, because you can see how beautiful the quilting shows up in that gorgeous white fabric…. Hmm, what would you choose? 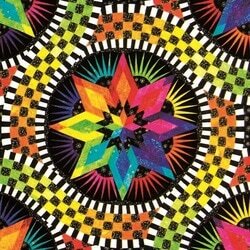 ​The Colorful Quilt is re-designed as "Enchanting Stars"
The Colourful Quilt was my first a-symmetric quilt design and the template sheet has to be printed on one sheet in order to avoid any mismatches in size. As there are only a few printers in the world (!) that are able to print on this size plus the special coated paper and UV resistible ink, the price is a little bit higher than a regular pattern. Due to the complexity we decided a couple of years ago to release 50 units as limited edition only as we were under the impression that there was limited interest for the pattern. But after a couple of years it is still one of our bestselling patterns ever! ​Stars in the Night is re-designed as "Stars of Light"
Stars in the Night is a combination of paper piecing and cutting. You have to make the lone star in the center from strips and you cut the star points in a 45° angle using a ruler. The remaining of this quilt, including the striped border is made with the paper piecing technique. 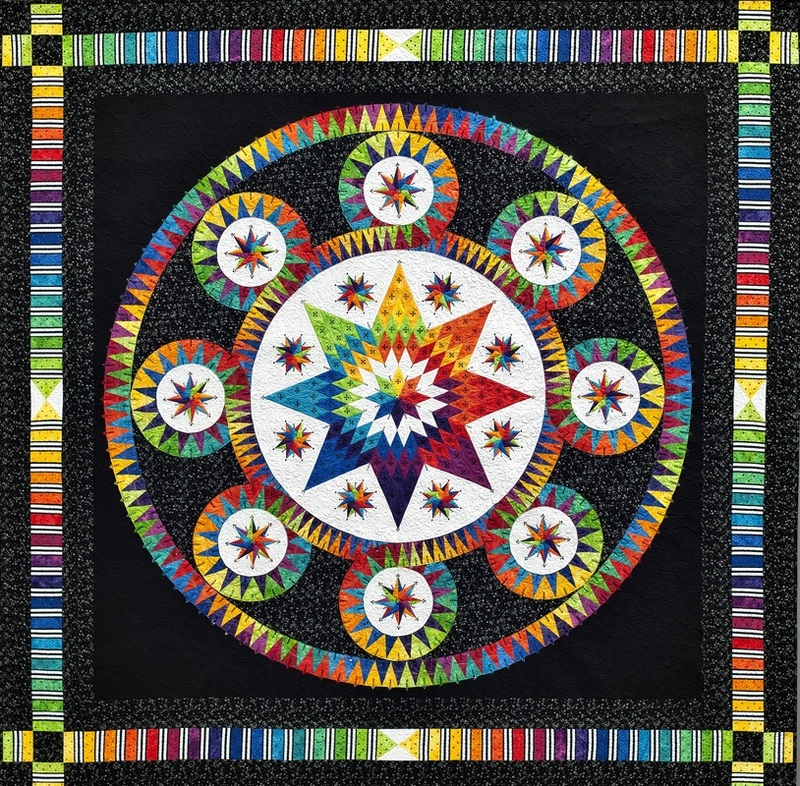 The bright colors in black makes this quilt a real eye catcher. The transitions of the star circles that are placed around the lone star start a few spikes before the curve and make a lovely and gentle color transition to the next star circle. ​When I was making Joy in 2003 I had no idea how my life would be look like 10 years later. I had a severe depression at the time, and when I try to recover I noticed when I was working on my quilt I was feeling better. That’s why I called this quilt Joy. This quilt brought back the happiness in my life again. ​When I was making the yellow and blue Bright Beginning I was surprised how beautiful that quilt looks when it was finished. 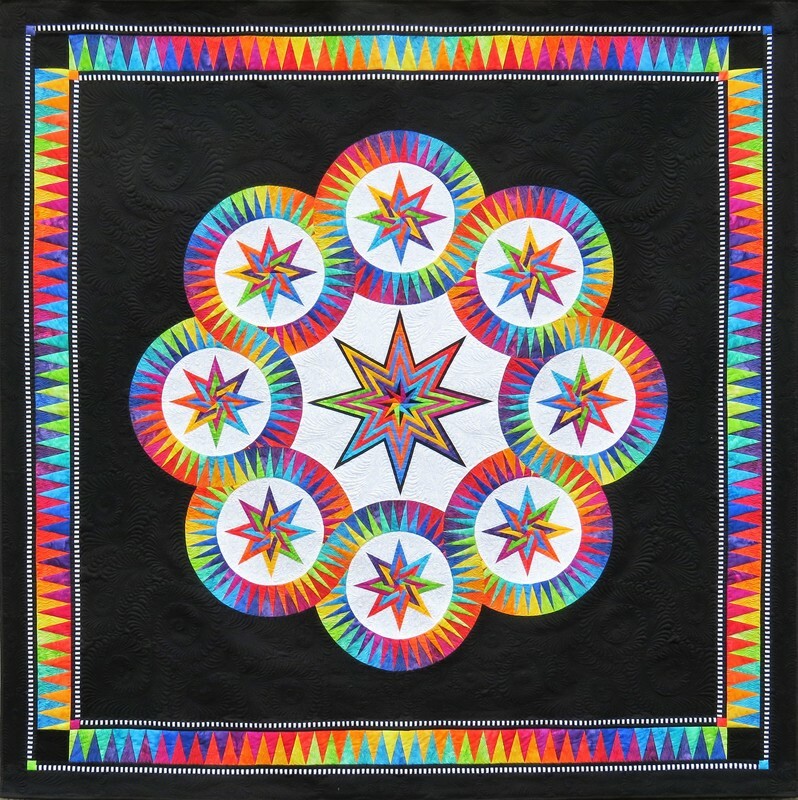 You will not only see the large compass star in the center and the square which forms the center of the quilt. I was wondering how that will turned out if I make Bright Beginning in my colorful fabrics. I love marble fabrics and I once had a huge collection of dots, large and small and sometimes I love to use them ;-) When I designed Kaleidoscope I thought it would be nice to use some of my precious marble stash. I think it became a different quilt, but it’s still a BeColourful quilt and with the little and large dots it looks totally different. But sometimes I think…. How would this quilt be in soft pastels: like yellow, pink, lime, aqua and peach.. This year, 2016, I finally re-designed this lovely quilt. However, not in these bright and vibrant colors. I've made this in the beautiful warm Autumn colors, greens, yellows and soft browns. That will gives you a whole different feel about this design. You will find it under the name 'When Summer Ends..' at the New Releases button.